Both poetic and scientifically accurate, THINK OF AN EEL relates the little-known lifestyle of a most intriguing fish. In graceful verse that matches the rhythm of an eel's movement, THINK OF AN EEL relates the little-known lifestyle of a most intriguing fish. 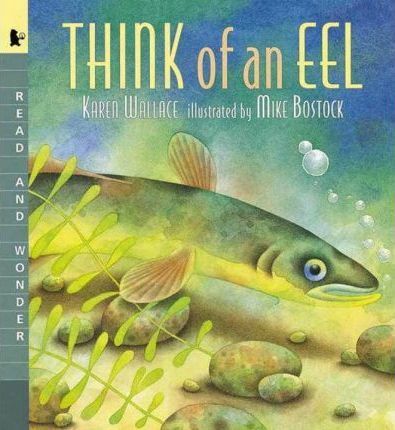 Children follow an eel from the day he is born, deep in the Sargasso Sea, to his years spent in the ocean, then join him on a trip up a freshwater river and return with him back to the sea, where he has his offspring. Fluid watercolor illustrations depict the sea and river setting in a story as captivating as it is true. "Young listeners who don't even know they want to know about eels are quickly enlisted to learn." Karen Wallace has spent time fishing in the rivers of Ireland. She says she didn't see eels very often, but "when I did, I couldn't get over how extraordinary they were." Mike Bostock remembers catching eels as a child. "But reading the text was an education for me," he says. "I had no idea they went through so many changes."